1Millennials rely on Facebook for their news far more than any other source. About six-in-ten online Millennials (61%) report getting political news on Facebook in a given week. Baby Boomers’ political media habits, on the other hand, are strongly rooted in local TV: A majority of them (60%) say they turn there for political news. Millennials’ relatively low reliance on local TV (37% watch political news there in a given week) almost mirrors Baby Boomers’ low reliance on Facebook (39%). Gen Xers bridge the gap, with about equal portions of online adults in this generation getting political news from Facebook (51%) and local TV (46%). 2 Compared with the previous two generations, Millennials are less familiar with many news sources we asked about in the survey. Overall, Millennials are less familiar than Gen Xers or Baby Boomers with 18 of the 36 news sources asked about (see our interactive database), including a number of sources whose audiences tend to fall on one side or the other of the ideological spectrum such as Slate, Breitbart, The New Yorker and The Blaze. They are more familiar than Gen Xers and Boomers with just two of the sources asked about: BuzzFeed and Google News, both digital sources. 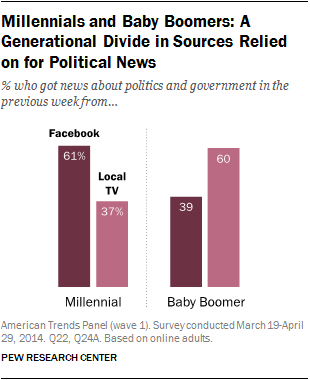 3 Millennials are no less trusting than Gen Xers and Baby Boomers of news sources they know. 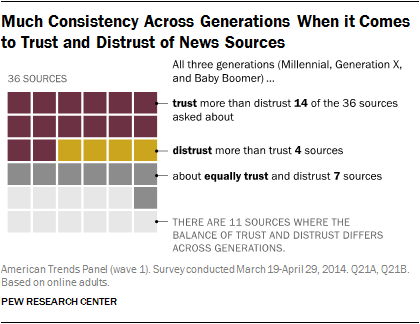 All three generations trust on average about four-in-ten sources they have heard of and distrust about two-in-ten. There are also few differences when it comes to which specific sources are trusted and distrusted across generations. 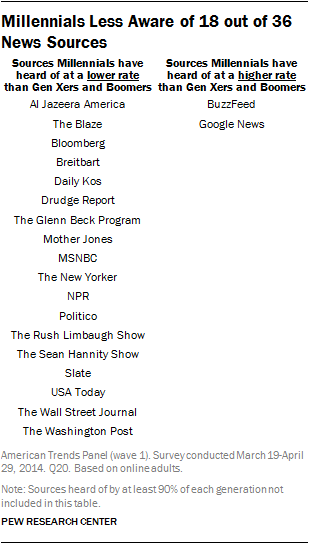 Fourteen of the 36 sources are trusted more than distrusted by all three generations, and four are more distrusted across the board: digital outlet BuzzFeed, and radio shows the Glenn Beck Program, the Rush Limbaugh Show and the Sean Hannity Show (Millennials are less familiar with all three of the radio programs). There are also three sources that are more trusted by Millennials, but more distrusted among Gen Xers and Baby Boomers: The Daily Show, The Colbert Report (which has recently gone off the air), and Al Jazeera America. 4Millennial Facebook users are exposed to more political content on the social media site than are Gen Xers or Boomers. Roughly a quarter (24%) of Millennial Facebook users say at least half the posts they see on the site relate to government and politics, higher than both Gen Xers (18%) and Baby Boomers (16%) who are on Facebook. Just 10% of Facebook-using Millennials see no political posts, on par with Gen Xers (11%) but lower than Baby Boomers (19%). Millennial and Gen X Facebook users are also less likely than Baby Boomers to see content on the social media site that supports their own views. About three-in-ten (31%) Baby Boomers on Facebook who pay attention to political posts say the posts they see are mostly or always in line with their own views, higher than both Generation Xers (21%) and Millennials (18%). At the same time, though, Baby Boomers are the least reliant on the site to begin with, so this tendency is only within a smaller portion of that generation as a whole. 5Millennials are less interested in politics than older generations. Roughly a quarter of Millennials (26%) select politics and government as one of the three topics they are most interested in (out of a list of nine). That is lower than both Gen Xers (34%) and Baby Boomers (45%). Millennials also discuss politics less often than Baby Boomers: While about half of Baby Boomers (49%) say they talk about politics at least a few times a week, just 35% of Millennials say the same. This is not, however, unique to their generation – 18- to 29-year-olds have historically been less interested than their elders in news about politics.